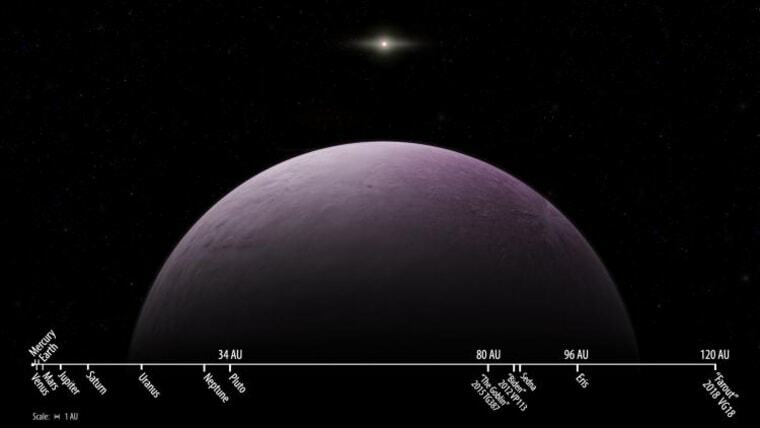 Astronomers said Monday they had discovered the most distant object ever seen in the solar system — and it's so far away that they nicknamed it "Farout." Known formally as 2018 VG18, the object is the first to be observed at a distance of more than 100 astronomical units from the sun. One AU is the distance from Earth to the sun, or about 93 million miles. Farout is about 120 AU, or about 11 billion miles, from the sun. If you could drive straight there at a steady 60 miles per hour, you'd be behind the wheel for more than 21,000 years. "When I first saw Farout and its very slow movement, I immediately knew it was a special object that must be very distant," Scott Sheppard, an astronomer at the Carnegie Institution for Science in Washington, D.C., and a member of the team of astronomers who made the discovery, told NBC News MACH in an email. Speed, of course, is relative. Earth orbits the sun at roughly 19 miles per second, according to Sheppard. Farout orbits at about 1 mile per second. At that speed, he said, it likely takes Farout "more than 1,000 years to complete one revolution" around the sun. Pluto, which since 2006 has been considered a dwarf planet, is currently at a distance of about 34 AU. It takes Pluto about 248 years to complete one orbit of the sun. Farout is thought to be a roughly spherical object about 300 miles in diameter. Its pinkish hue suggests that it is rich in ice, but little else is known about the object. Sheppard and the other team members, David Tholen of the University of Hawaii and Chad Trujillo of Northern Arizona University, first spied Farout in photos taken Nov. 18 with the Subaru Telescope on Hawaii's Big Island. The discovery was confirmed in early December with the help of an observatory in Chile. Farout was discovered as part of the team's ongoing search for a long-hypothesized Planet 9 and other distant solar system objects. In October, the team announced that they had discovered another extremely distant object known as "The Goblin." It's about 80 AU from the sun. "We are performing the largest and deepest search ever...for distant solar system objects," Sheppard said in the email, adding, "This wasn't a serendipitous discovery, as it is exactly what we are looking for — for solar system objects that are way, way out there, far beyond Pluto." Sheppard said it would take another year or two of observations to determine the details of Farout's orbit — including whether gravity from another as-yet-undiscovered distant object is affecting the dwarf planet's trajectory. Once the orbit is nailed down, it could help settle the question of whether there really is a ninth planet orbiting the sun beyond Neptune. "Other dwarf planets have unusual orbits that suggest a somewhat massive Planet 9 is out there, shepherding the orbits," Sara Seager, a planetary scientist at MIT in Cambridge, Massachusetts, said in an email. "It will take time, but once the new object’s orbit is known, it could help bolster or refute the existence of Planet 9."